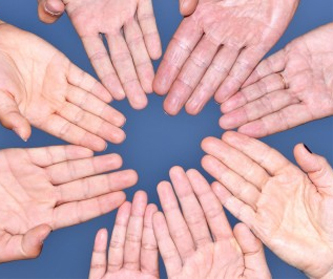 Extraverts have wider palms, introverts have longer fingers! • Phantom Pictures for the Hand in Extraverts & Introverts! _- EXTRAVERSION, 2D:4D digit ratio & hand shape! • WHY PALM CREASE NAMED the Simian Line? Measurements on the hands of introverts & extraverts reveal that introverts tend to have longer fingers than extraverts, while extraverts tend to have wider palms than introverts. How surprizing are these results really? The proportions of the hand are generally known to vary with e.g: gender, body height, cultural background & occupation. Interestingly, since the 19 century various scientists and palmists have suggested that hand shape (hand type) also correlates with personality, but so far little evidence had been presented. Results are presented here from a 2012/2013 Dutch hand research study in 34 females (20 extraverts + 14 introverts) + 14 males (7 extraverts + 7 introverts) - who were selected by age (19-54), ethnicity (white), IQ (above average) and high/low scores on the Extraversion dimension of the Dutch version of the NEO PI-R personality questionnaire. All hand materials were collected in 1997/1998. • Extraverts have wider palms, introverts have longer fingers! • How to identify Extraversion/Introversion via hand shape? Hands have been classified differently and Extraversion has been associated with hand type in various constitutional models. Let's take a closer look at the details. Psychiatrist Ernst Kretschmer's constitutional approach (1930's) includes 3 main body types, and this work became the basis of psychologist William Herbert Sheldon's constitutional psychology (1940's). "The leptosome-asthenic type (ectomorph) has long, slender hands characterized by long fingers. The athletic type (mesomorph) shows rougher, wider hands, but overall, the best balanced. And the pycnic type (endomorph) has a short, wide dorsum and short, conically formed fingers." "Rees (1960) and Eysenck (1960) have made a thorough review of the literature; it would appear that there is a distinct relationship between introversion and leptosomatic bodybuild, i.e., and between extraversion and pyknic bodybuild, i.e., width and thikness as opposed to length. Correlations in representative studies range from 0.3 to 0.4 with occasional values above or below these." During the 2nd part of the 19th century and about two-thirds of the 20th century, Casimir Stanislav d'Arpentigny's system formed the basis of most western hand reading systems. This model describes 7 hand types: the elementary hand, spatulate hand, square hand, conic hand, philosophic hand, psychic hand, and the mixed hand. Dutch hand analyst Edo Sprong (1991: Hand Analysis - The Diagnostic Method) describes the spatulate hand type as (p.51): "They have broad interests and are particularly curious about anything new. They are therefore extroverted in nature. "; square hand type (p.54): "Of all the psychological types delineated by the psychologist C.G. Jung, people with this hand shape correspond most closely to what he called the 'extroverted thinking type'. "; philosolophic hand type (p.61): "People with philosophical hands correspond most closely with Jung's 'introverted thinking type'. "; psychic hand type (p.65): "People with this type of hand can be most closely compared with Jung's 'introverted intuitive type'". A modern hand type model that is gaining popularity in the field of hand reading today concerns the Elemental approach. UK Palm reader Fred Gettings' variant (1973) describing 4 hand shapes is more commonly used in the Western world than the original Chinese Wu Xing approach - a.k.a. Wu Hsing school - which describes 5 hand types). Gettings (1960: Palmistry Made Easy) described the Fire hand shape as (p.70): "... he is extremely extrovert by nature..."; Air hand shape (p.67): "... although the type is extrovert by nature, he will be a little restrained..." and Water hand shape (p.73): "... the introverted energies do not tend to react quite so quickly...". Studying hand shape is a complex task that can include many aspects of the hand. 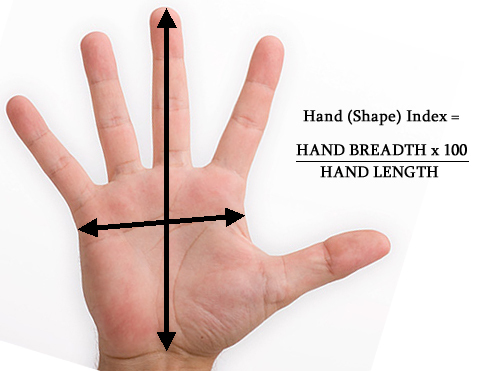 The easy way to study the proporportions of the hand is to calculate the so-called 'hand (shape) index' (a.k.a. 'hand shape index'). Finger length and palm shape proportions are the next necessary steps to assess overall hand shape. Other hand features (such as the 2D:4D digit ratio) may be included in a more advanced assessment of hand shape. The research results for these hand proportions are presented below. The hand index is generally known to vary among males and females: females tend to have slender hands, resulting in that the hand index typically is about 1 point lower in females compared to males (Napier, 1980). But hand index also varies among nations (Asians are generally known to have slender, narrow hands). The results for the Dutch University student population show that as expected the males have a 2.6% higher hand index than the females. Interestingly, when the students are grouped for personality a likewise tendency is noticed: extraverts have a 2.9% higher hand index than the introverts: extraverts tend to have wider + shorter hands; introverts tend to have longer + narrower hands. The palm index is generally known to vary among males and females: females tend to have slender palms, resulting in that the palm index typically is about 2.5 points lower in females compared to males (according publications from 7 countries). But hand index also varies among nations (Asians tend to have narrow palms). The results for the Dutch University student population show that as expected the males have a 2.2% higher palm index than the females. Interestingly, when the students are grouped for personality a likewise tendency is noticed: extraverts have a 2.7% higher palm index than the introverts: extraverts tend to have short, wide palms; introverts tend to have long, narrow palms. The finger vs. palm index provides a measure for finger length. In general females tend to have longer fingers (relative to palm proportions) than males, and in females finger length usually exceeds palm breadth (Japan belongs to the few countries where this tendency can also be observed in males). The results for the Dutch University student population show that as expected the females have longer fingers (+2.3%) than the males. Interestingly, when the students are grouped for personality a likewise tendency is noticed: introverts have finger lengths that exceed over 2.0% the finger lengths in extraverts. introverts tend to have longer fingers; extraverts tend to have shorter fingers. NOTICE: The picture at the bottom of this page presents a visual impression of these results in an international perspective for finger length variations. The results presented above show that Extraverts tend to have wider palms with shorter fingers (= a masculine combination), and introverts tend to have longer fingers with narrower palms (= feminine combination). And the so-called 'hand index' appears to be the most significant measure for discriminating both groups in terms of hand shape: e.g. see the picture at the bottom of this article! - the so-called 'Earth hand shape' [E] and it's related variants [E(F)] were not observed to be dominant in any of the hands. - the so-called 'Water hand shape' [W] and it's related variants [W(F), W(A)] are much less common in Extraverts (13.0%) than in Introverts (47.6%). These results provide confirming evidence for Gettings' guidelines that 'Fire hand shape' - and in a lesser degree 'Air hand shape' - provides a clue for Extraversion, and 'Water hand shape' provides a clue for Introversion. However, the results also suggests that it is very hard to discriminatie Extraverts from Introverts through hand shape only! • Extraversion, 2D:4D digit ratio & hand shape! 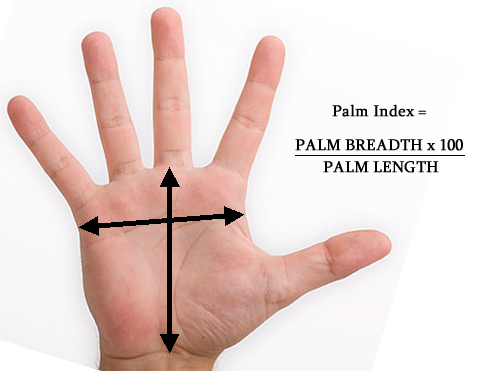 than palm length - which indicates that in this perspective the 'hand index' is probably the best discriminator! Agreeableness, Conscientiousness, Extraversion & Neuroticism!